"It would be a waste of money to produce, it wouldn't sell well." Agree. If it would get in production, it would have a strong competition. BMW's new i8 will be cheaper than the e-Tron and has similar performances. Also I doubt that anyone would take this over an much faster R8 V10 with around the same price as the e-Tron. I recently just played Asphalt 8 and I use this car to race. It's totally crap and I have difficult beat Tesla Model S. I hope the real one doesn't have crap performance. Audi, please increase it's max speed. It would be a waste of money to produce, it wouldn't sell well. @ Fangio Man: I hope it doesn't. Well, let's see if it really will reach production. Better Nordschleife time comes later too. The specs are completely different for production version. For the i8 a price of 130.000-140.000 € is planned, for the e-tron over 150.000 €. Anyone heard of the upcoming BMW i8? I heard it might be the reason the e-tron was canceled, because of too much competition. Audi claimed it to be more expensive than the V10 (ca. 146.000 €). "No thank you, ill stick with a regular R8." I totally agree with you, BR2. 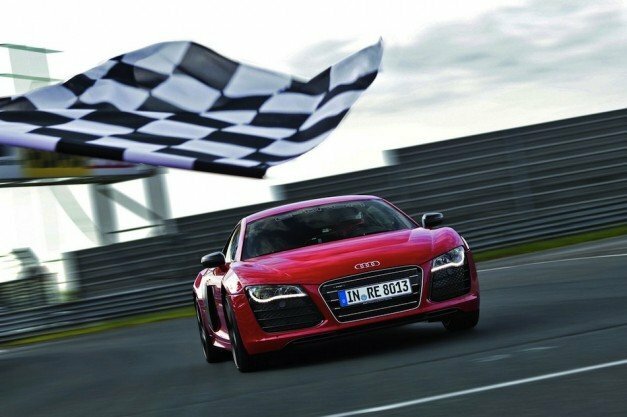 The 2006 R8 4.2 FSI (to make the comparison a bit more fair) has a better or atleast the same track performance as the E-Tron, and also a better straight-line speed. Also I guess it is cheaper than the E-Tron, which I do not know the planned price of. This car has ben cancelled, then back on, then off, then on, then off, then on, but know it looks like its been officially canceled, I think due to production costs. Not that it matters to me, I don't think they should have bothered with an electric R8 in the 1st place, more expensive car that looks the same, performs worse, sounds worse, and most likely more issues, with but not including reliability and maintanince? No thank you, ill stick with a regular R8. Will the R8 e-tron ever hit the production? Or will it count as a prototype forever? And the data is already old. Specifications of the 2013 prototype are totally different. So I think the page should be deleted. Audi canceled the project last year. But it could get in production next year. is 197 kmh the full topspeed or the nordschleife top speed? The thing is, that Audi wanted to do another record by doing 2 laps. To menage that, the driver had to reduce the energy consumption. To enhance that, the top speed was limited additionally. It'll come as a small-scale series later this year. It isn't called 'e-tron quatto' but only 'e-tron'. As far as I remember, only the 2007 'original e-tron' was equipped with 4 electric motors. It's just a concept not a production car! Is this even a full blown production car? And i herd Audi raised the limiter to 155mph from its 125mph 'Production' spec car, so would that not mean its not stock and not be counted? if so then the correct lap would be 8:26.069 according to Audi..but it seems a lil weird that it would take off 17s from that. Does anyone have the weight? It should have one of the best ring times for it's power to weight ratio. The two electric motors power the rear axle independently.